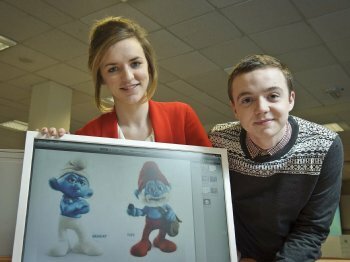 Sixth formers from across Northern Ireland have been given ‘hands on’ experience of the computer industry and an insight into career opportunities in the sector, thanks to the University of Ulster’s innovative approach to work placement. They were selected to participate in a two day intensive ICT workshop hosted by the School of Computing and Intelligent Systems on the Magee campus, in conjunction with local company, School Employer Connections. The workshop, led by computing lecturers, Dr Jose Santos and Martin Doherty, was designed to give the sixth formers a flavour of what it would be like to study IT, Computer Science, Computer Games and/or creative computing at Ulster’s Magee Campus. The pupils attended talks on web development, computing animation and were shown how to use multimedia tools and technologies. They also got a chance to use CrazyTalk and Dreamweaver software to develop their own websites. Dr Santos explained how the ICT workshop was one strand of the School of Computing and Intelligent Systems’ successful widening access initiative, which also includes the WASP project (Widening Access in Primary Schools) and the ICT summer camp. Professor Liam Maguire, Head of the School of Computing and Intelligent Systems said: “The innovative placement programme was designed to give students a better understanding of how subjects they study at university can help improve their career prospects. Owen Crozier, Manager of the Work Experience Programme at School Employer Connecions, an organisation that works with over 500 employers and more than 50 post-primary schools throughout Northern Ireland, said the feedback from both the schools and the employers had been very positive. Pupils from thefollowing schools took part in the workshop: Coleraine High School; Limavady Grammar; Loreto College, Coleraine; Oakgrove Integrated College, Derry; Omagh CBS; Rainey Endowed School, Magherafelt; St. Columb’s College, Derry; St. Mary’s College, Limavady; St. Mary’s College, Derry; St Michael College, Enniskillen; St. Patrick’s College, Dungiven; St. Patrick’s College, Maghera; St. Pius College, Magherafelt and Strabane Academy.